Women who are trying (or really not trying) to get pregnant might already be familiar with the app Glow. And now the S.F.-based data company, which claims it has helped over 20,000 women conceive, has launched Glow Nurture, a brand-new app for those of us knocked up ladies. 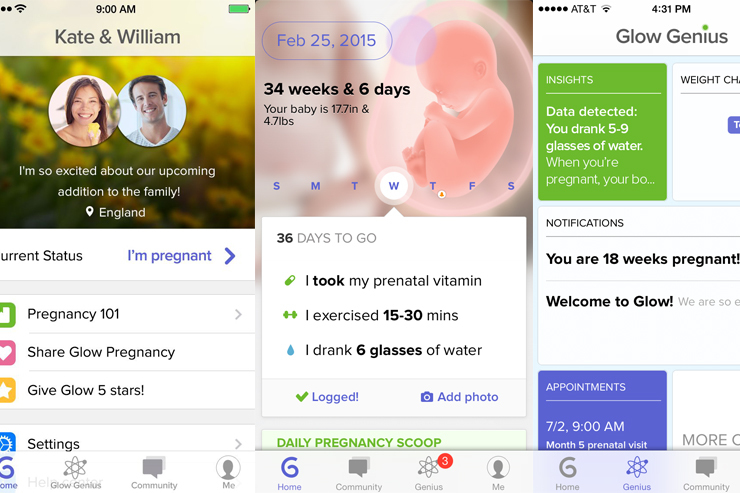 Move over BabyCenter, this next-generation app is a daily log-in for the new mom-to-be, allowing her to track her health and her baby’s growth, take bump selfies (and instantly email them to friends), track her weight, nutritional intake, and moods (and get alerts and guidance if anything seems out of the norm to Glow’s team of data-crunchers), keep track of all of those upcoming doctor’s appointments, and swap information and share articles with other members of the Glow Nurture community. Plus, there’s a place for your partner to view all of this information so he or she can follow your pregnancy journey right alongside you. The app is free and, as of today, can be downloaded on iTunes (an Android launch is coming soon). Any preggos willing to take it for a test drive and let us know what you think?